We are currently developing a bioinformatical arm to the Sharples Muscle Lab. With our first bioinformatics paper just accepted in Scientific Reports (Nature) entitled: ‘Comparative Transcriptome and Methylome Analysis in Human Skeletal Muscle Anabolism, Hypertrophy and Epigenetic Memory.’ Click to get the PDF here! Indeed, transcriptome wide changes in human skeletal muscle after acute (anabolic) and chronic resistance exercise (RE) induced hypertrophy have been extensively determined in the literature. We have also recently undertaken DNA methylome analysis (850,000 + CpG sites) of human skeletal muscle after acute and chronic RE, detaining and retraining, where we identified a role for DNA methylation in an epigenetic memory of exercise induced skeletal muscle hypertrophy (Seaborne et al. Sci Reps, PDF) and see paper in Scientific Data (Nature) PDF. However, it is currently unknown as to whether all the genes identified in the transcriptome studies to date are also epigenetically regulated at the DNA level after acute or chronic resistance exercise. We therefore undertook large scale bioinformatical analysis by pooling the publicly available transcriptome data and comparing these large data sets with our genome-wide DNA methylation analysis in human skeletal muscle after acute and chronic resistance exercise, detraining and retraining. 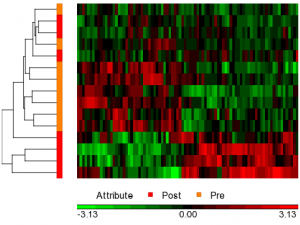 Figure above : Heatmap displaying the top differentially regulated genes after acute RE in pooled transcriptome analysis from over 100 muscle biopsy samples and out of 15,000 shared genes. This article has now been published in full in Scientific Reports PDF. Importantly, this paper for the first time across the entire transcriptome and epigenome combined, identified novel differentially methylated genes associated with human skeletal muscle anabolism, hypertrophy and epigenetic memory. 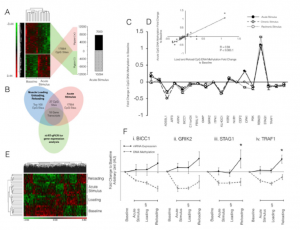 The data also demonstrated that there are DNA methylation with corresponding gene expression changes in gene networks predominantly associated with the extracellular matrix / actin structure and remodelling, mechano-transduction and TGF-Beta signalling after both acute and chronic resistance exercise. Furthermore, that some of these genes are remaining differentially methylated even when detraining occurs after a period of exercise induced hypertrophy, highlighting these as epigenetically regulated memory genes.